The 2019 Women’s March was the first one that I ever attended, and I was unsure of what to expect. I had seen the seas of pink hats. I heard about the initial lack of leadership from women of color and the current concerns around anti-semitism among lead organizers. I read about the crowds of thousands who had turned out to the previous Women’s Marches. I worried about how I would navigate that space as an organizer who comes from a background working on small campaigns deeply rooted in community. What grounded me in planning our YWCA participation in the march was identifying where our issues intersected with those of the Women’s March platform – racial justice, gender justice, immigrant justice. These issues were at the core of our work at YWCA, and the Women’s March provided an opportunity to share our message with a huge audience. Our local associations were empowered to participate in their local Women’s March celebrations, speak on local issues impacting their communities, and take action by engaging with decisionmakers. And as we walked towards Freedom Plaza last Saturday, I felt humbled to hold signs with ‘Silence is Complicity,’ ‘Empowered Women Empower Women’ and ‘My Existence is My Resistance’ knowing the hundreds of thousands of people in the YWCA network and beyond who we marched in solidarity with. Showing up for all women, demanding justice and equity, amplifying the voices of those most impacted – that is why we marched. Ultimately I realized that regardless of the space you are in, you can show up as your full self and leverage the energy and momentum around you to further your own campaign. This experience was a lesson in navigating the many organizing spaces that exist in a movement towards deep social change and liberation. Sometimes the spaces that are big and visible and well known are not in complete alignment with your personal beliefs of movement work, and that is okay. The trick is being so grounded in your values that you can show up as a radical organizer in a space like the Women’s March and utilize the moment to amplify your message. The sea of pink hats was certainly true, but I also saw profound messages naming the injustice faced by black trans women, missing and murdered indigenous women, undocumented and immigrant women. These are the messages that disrupt the narrative of white feminism and push the larger movement to be intersectional and inclusive. 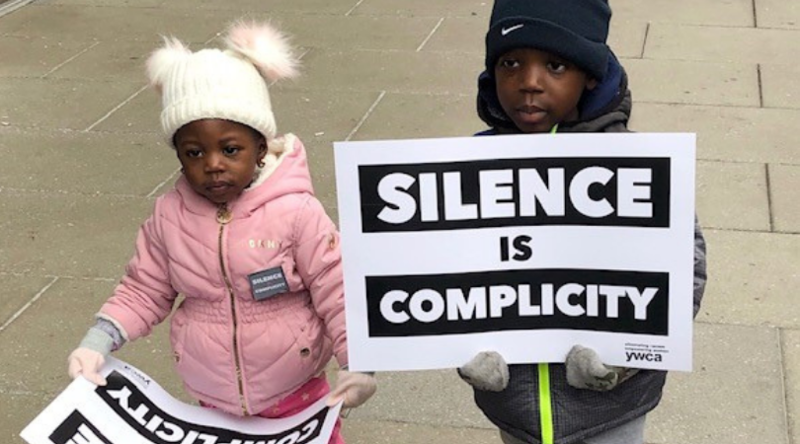 We are in a time of great upheaval and reckoning – the #MeToo movement forcing powerful people to be held accountable for their actions, social media spreading images of inhumane and unjust treatment of people held in detention and daily reminders of the continued assault on black and brown bodies within a society that was never built to protect them. It is these moments of collective gathering when it feels that at least for a few hours, we can be heard, we can be seen, we can shut down the streets and take up space.